Who gets notified when you have a new lead? Learn how to specify who is notified here. When a new lead is automatically dropped into your lead manager from one of your lead contact forms OR from your listing in Aisle Planner's marketplace, you have the option to specify who is automatically notified that a new lead is ready and waiting in your lead manager. The owner of the account in Aisle Planner is set as the default to be notified, but you can change this or add additional team members to receive new lead notifications. 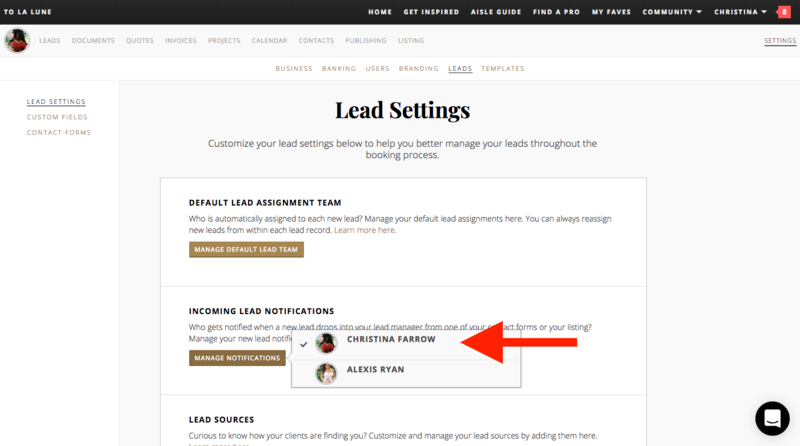 To get started, head on over to the Settings tab and click on Leads - you'll see the Incoming Lead Notifications section towards the top. Next, click on the gold Manage Notifications button. Click to add a checkmark next to the names of any team members who should automatically receive new lead notifications. These team members will receive new notifications via email and in-app through their notification center. If you no longer wish to send automatic notifications for new leads to a team member, just click on their name to remove the checkmark.